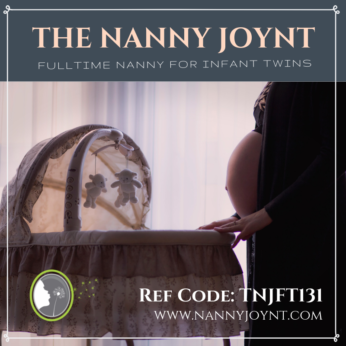 The Nanny Joynt is very happy to share an amazing full-time position available with newborn boy/girl twins!!! The twins are due in May and these new parents are excited to add a wonderful nanny to their family. This is a loving two mom family who wants to find an amazing nanny who can help with the care of their children. This family is seeking a reliable, patient and confident career nanny to join their family. A nanny who will take initiative, has great work ethic, is honest and caring ~ a nanny who really LOVES her job and takes pride in her career caring for children! Monday – Friday 8:00am – 4:00pm with some flexibility. Could be until 5pm some days. safety conscious, and very active with the children each day. understanding with their children is most important to them. Their nanny should also be warm, calm, flexible, attentive, punctual, self-driven, and motivated; someone who is kind, happy, and loving. Their nanny should always have a positive outlook and really enjoy spending time with their sweet babies! Light house cleaning, wiping down kitchen counters, tidying house each day, etc. This family does employ a housekeeper who comes weekly for deep cleaning. 10-15lbs each. The dogs may need care during the day, letting in and out, feeding, watering etc. ideal. Both parents are genuine, nice, outgoing and easy to communicate with. is to have positive and happy home for their children. Their new nanny will be welcomed into a family dynamic with open arms, as they will have the most important job in their home!